Built-in export to 3D-PDF, Excel, VRML, DXF and more. 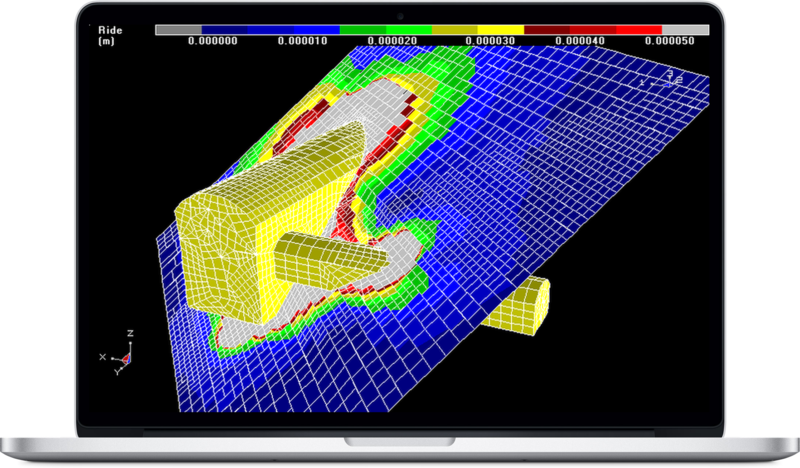 What sets Map3D apart from other analysis programs is its ability to accommodate a very wide range of problems in 3D. Large, complex, fully 3D problems can be built with ease using the built-in CAD functionality. Combined use of both FF and DD elements allows for simulations of 3D excavations with intersecting fractures or shear planes. The various versions of Map3D fully support plastic Fault-Slip and 3D rock-mass plasticity, featuring compatible input files for all versions thus providing a clear upgrade path as upgrades to advanced capabilities are required by the user. Powerful integrated CAD interface, no third party software required. - Import/export facility for input data to other CAD programs. Extensive training program for both program functionality and detailed engineering results interpretation. Easy manipulation of results for interpretation of rock mass failure, slip on fault planes, results on oriented bore holes and ubiquitous slip on bedding planes or joint sets. Powerful pre-processing capabilities automatically fix most model construction problems. Overlapping and intersecting surfaces are accommodated by the program without user intervention. Model discretization can be optimized by setting a few control parameters to automatically concentrate elements at locations of interest. These capabilities greatly ease the burden of model building letting you get on with engineering rather than spending your time debugging models. May 2018 - Perth, Australia. Course Theme: The entire course will concentrate on hands on learning of model calibration, interpretation and application allowing participants to work through real examples in a combined lecture/tutorial style. I have been using Map3D since the beginnings of this underground project. It has been the main tool for our analysis involving drift scale analysis, macrosequence analysis and seismic forecasting analysis. We like this tool because it is easy to learn and we can get good values to start working in engineering in short time. All of this makes Map3D an excellent tool for us..
Yeah, I have been using Map3D since 2008 and I found it is a very powerful and flexible tool for stress modeling and model calibration: underground observations of ground response against stress redistribution. When I had questions about some features or special needs I asked directly to you and I found a very prompt and professional response. I have been a Map3D user since the mid-nineties and have used it routinely for the past 20-odd years of my career for improving my understanding of underground rock mechanics design issues. The code and user interface are simple to use and intuitive, having developed over many years of user interaction and continuous improvement. With Map3D, the response time to support-related queries is always swift and suggestions for code enhancements are welcomed and acted on. From the earliest years of my association with Map3D I have been fortunate enough to know Terry Wiles personally and professionally and his ideas and teachings have inspired me in my pursuit of practical numerical solutions to mine design. With Map3D program I can easy and fast construct and model underground rock excavations. The provided support is good because it is fast and I get answer to my enquiries and suggestions that helps me to improve and finish my model. Ready to Order or renew your Map3D licence?